Ahly will be missing the services of injured midfielder Amr El-Sulaya for six weeks, while teammate Mohamed Hany will also remain on the sidelines for at least two weeks, according to the Cairo giants’ team doctor Khaled Mahmoud. El-Sulaya and Hany were obliged to depart the pitch during Friday's 3-0 loss to Tunisia's Esperance in the African Champions League final after picking up different injuries. "Medical scans revealed that El-Sulaya is suffering from a sprained ankle, an injury that will sideline him for six weeks," Ahly's doctor was quoted as saying by the club's official website. "Hany is also suffering from an ankle injury and needs from two to three weeks to rejoin the trainings," he added. Esperance overturned a 3-1 first-leg deficit last week to earn a deserved 3-0 victory over Ahly in the return match in Rades on Friday, securing their third title in history with a 4-3 aggregate win. Ahly midfielder Hisham Mohamed was excluded from the return leg as he was suffering from a muscular strain, as well as being injured in his head by a thrown stone when Esperance fans attacked the Reds' bus ahead of the game. "Hisham Mohamed will rejoin the trainings within a week. He is progressing well in his rehabilitation programme," the Ahly doctor explained. 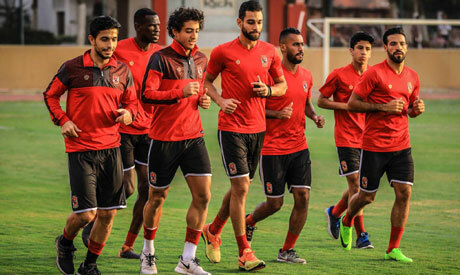 Ahly will resume trainings on Wednesday to start their preparations for facing UAE's Al-Wasl on 22 November in the return match of Zayed Champions Cup round of 16. Ahly held to a 2-2 draw in the first leg in Alexandria on 28 October.